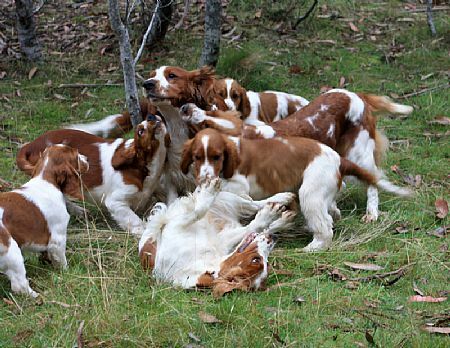 Welsh Springers are happy, busy, comical and inquisitive, the world was made for their enjoyment and they are quite intent on doing just that. Although reserved with strangers, they are not timid, shy or unfriendly. 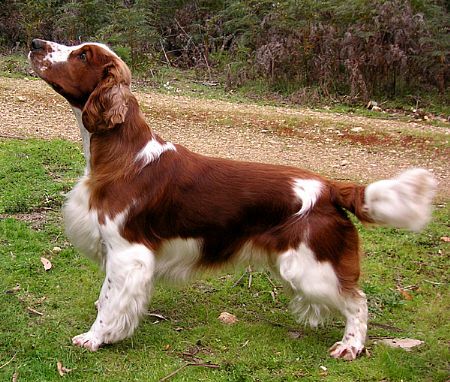 They were bred as a flushing spaniel, so spend lots of time with noses to the ground and tail wagging furiously. They give voice when they are hunting, and also 'talk', which can range from a yodel to a full bark, when they greet your return. 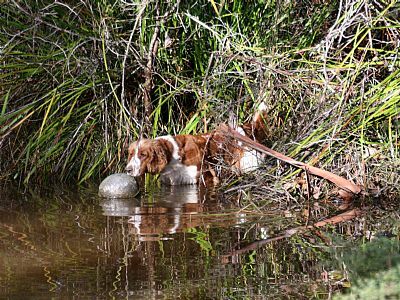 They love water, any water, the sea, river, dam, muddy puddle or your sister's water-plant pot, puppies will lay in their water bowls. 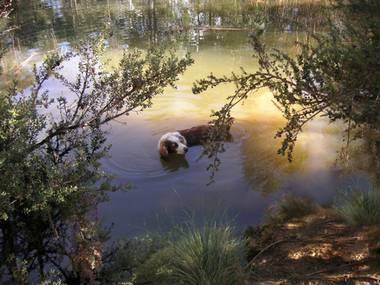 They are good natural swimmers and retrievers. They are loving and like cuddles, but most of the time there are lots of other important things to do! 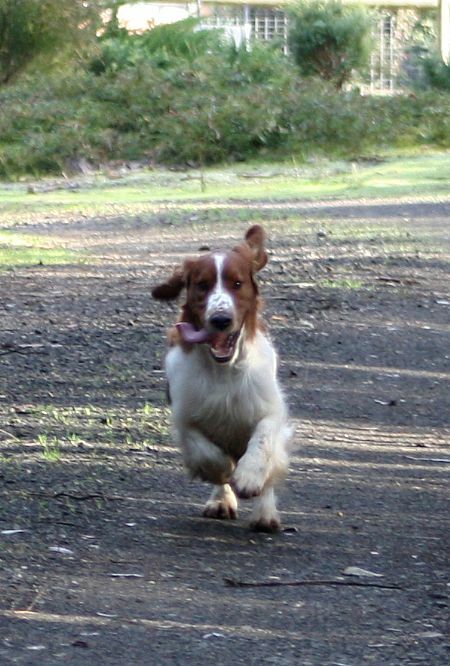 They insist on routine, and this includes exercise, mine know exactly what time morning and afternoon runs occur. To prevent boredom they do need regular exercise, but as they are generally great entertainment it never becomes a chore. 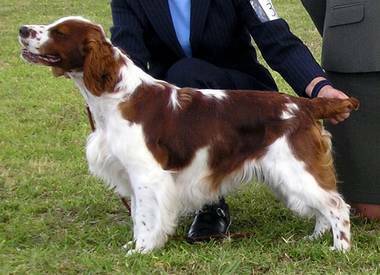 They have a soft beautiful red and white coat, (no other colour), which sits flat on their body and is lightly feathered. 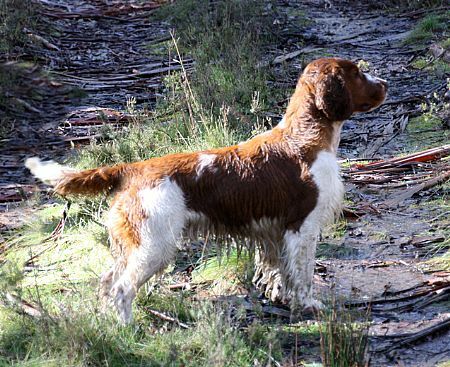 It is one of the easiest of the coated spaniel breeds to care for, a brush each week and combing the feathering will keep you out of trouble, and when they do get wet and dirty, the dirt drops out when they dry. When bathing a good lanolin base shampoo is best as well as using a lanolin conditioner especially on the feathering, and this can be also applied when combing through the dry coat if you have problem knots. Trimming for pet only owners, I would recommend the feet be trimmed level with the pads, and perhaps the ears trimmed level with the leathers, as they will reach in the food bowl if left. For the show people, they require necks, ears, feet and tails maintained, this can take 1/2 an hour or a lifetime, just to perfect the last hair! Welsh do suffer from severe SELECTIVE deafness, and will do most things in their own time, its not disobedience, to them you just have to understand there are so many other interesting things to do! If you like your dog to be a robot, this is not the dog for you! 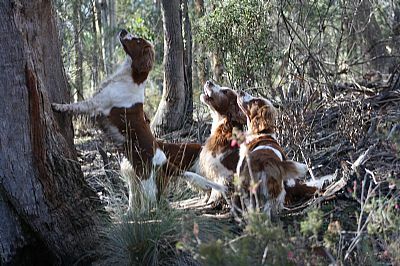 However if you take this into consideration and don't demand of them, but instead make training exciting and enjoyable, (did I mention their love for food,) they are very quick to lead train, have excellent natural hunting and tracking abilities, and enjoy the dog sports, such as agility and jumping. They respond best to praise and reward, so clicker training and food rewards will certainly speed up your efforts and not create stubborness. 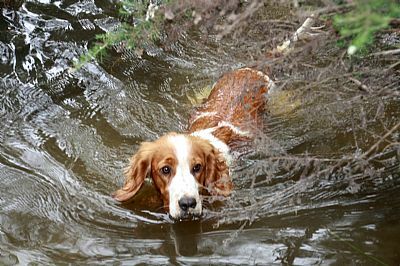 Some do well at obedience, they just need it to be a totally positive experience so it is something they want to do. As mentioned before they like routine, start off at puppy stage with what you want as an adult. Once they have reached maturity their food intake needs to be carefully portioned as they will quickly put on weight. 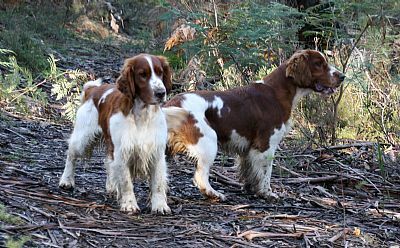 Because they have a white based coat some can be sensitive to lots of preservatives and grain based diets, and although they will eat anything, we have found they are healthiest on a natural RAW fresh diet with plenty of raw meaty bones. We have been feeding Dr. Ian Billinghurst's Give a Dog a Bone Diet, now referred to as the BARF diet, since 1995, this has given us the best results. Generally a healthy, robust dog. 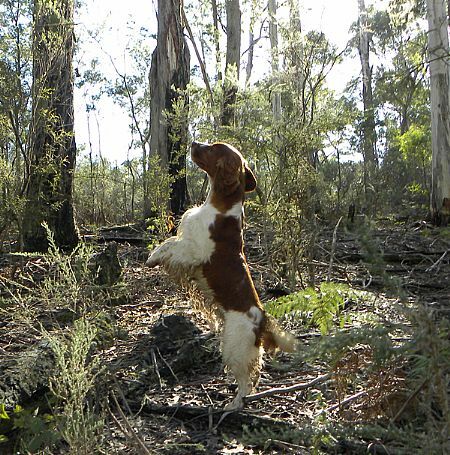 Breeders have been hipscoring their stock to help prevent the occurance of hip dysplasia, and most lines have been scored for 3-5+ generations. Elbow scoring has also been introduced. 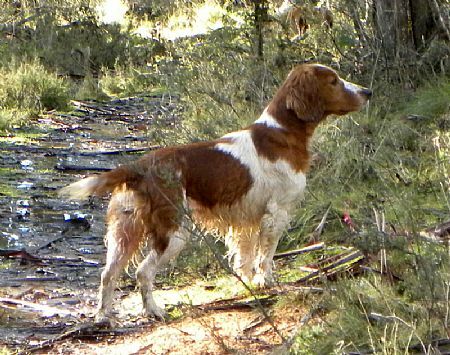 Epilepsy has appeared in the breed, and breeders are mindful in their attempt to breed with healthy stock. Breeders are now eye testing their stock as recommended by ACES which includes testing for Hereditary Cataracts & Goniodysgenesis, (as it is considered to be a predisposition to glaucoma), the effectiveness of this is yet to be established. Although breeders do all they can to insure they produce healthy puppies, it must be remembered that diet, correct weight and exercise when puppies are young and their joints are still developing also contribute to a healthy adult, as environment and injury can cause problems with joints as well as eyes. 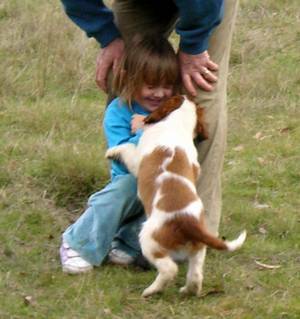 Socialisation at a young age is also key to having a happy, well balanced dog, regardless of breed.